The Side Module feature has become so robust, its name has become a misnomer. Side Modules are not just restricted to the "sides" of your KB site. This document will help describe Side Module functionality and how you can use it to best engage your users. 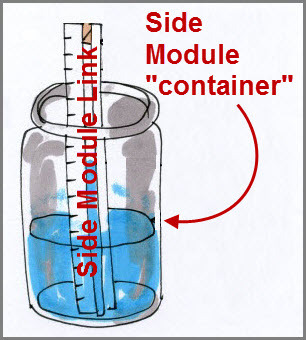 For you visual thinkers, imagine when you create a Side Module, that you are creating a "container" in which you will place Side Module Link(s). For example, you may create a Side Module called "Media Outlets" inside which you will have Side Module Links to "BBC Mundo", "CNN", "NPR", "Tech World" and "Wired". Navigation: SitePref tab > Side Modules > Side Modules screen. The image below shows a blank Side Module waiting to be customized. Note the positional options in the aptly named Position field's menu. The image below shows a blank Module field circled in red and also shows all the options available. These options will be further illustrated below. You may define as many Side Modules as you would like. After you enable the specifics of your Custom Side Module, click the Add button. Should you only click the Update button, your custom Side Module will not be saved. *The Update button saves edits to existing Side Modules*. Module name - Name of your Side Module. Position - select one from the dropdown menu. The image below has Top Left and Top Right Links circled in yellow. The image below shows a blue arrow pointing to the Link Bar. The image below shows a blue arrow pointing to the Menu Bar. Under the "Publications" menu item, you will see four items to choose from in the dropdown menu. Internal - Check/enable if you want the Side Module availability on the Internal Live site. External - Check/enable if you want the Side Module availability on the External Live site. FullView -Check/enable if you would like your Side Module to appear when viewing on a full desktop/ laptop screen view. MobileView - Check/enable if you would like your Side Module to appear when viewing on mobile devices. DocPage -Check/enable so the Side Module will appear on any other page within your KB. In the image below, you see that the Side Modules appear whenever you pull up a document. 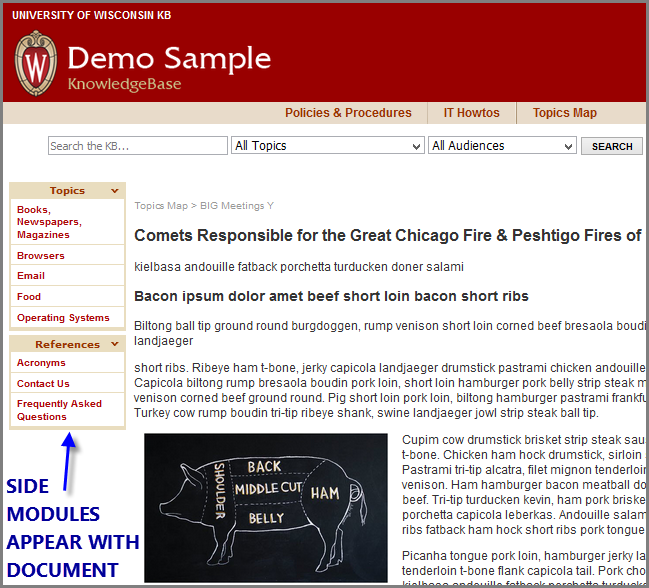 If your content is better presented using the full screen, then do not check DocPage. Order - Select what order the Content Modules will appear on your site. *Add - Please be sure to click this button to add the your Custom Side Module. If you only click on the Update button on the bottom of the screen, your new Custom Side Module will not be added. The Update button only updates existing content. After creating the Side Modules that best suit your KB site, you will see downward pointing arrows on the upper right corner of each Side Module. The arrow indicates that the Side Module is collapsible and then expandable. The KB will remember what you choose to collapse and what you choose to keep expanded the next time you visit the live site.These downward pointing arrows/ chevrons are accessible to those accessing the KB via a screen reader by means of the keyboard, specifically the spacebar. Note: For information about adjusting your Side Module width, please see 30020. Navigation: SitePref tab > Side Module Links > Side Module Links screen. The image below shows a blank Side Module Link waiting to be customized. Note the red arrow leads to the names of existing Side Modules. This image shows "References" as the Module name. the aptly named Position field's menu. The image below shows a blank Module field circled in red and also shows all the options available. These options will be further illustrated below. Internal - Check this box if you want the Side Module Link available on the Internal Live site. External - Check this box if you want the Side Module Link available on the External Live site. Popup - which specifies if you'd like the link to open in a new window/ tab in your browser. *Add - Please be sure to click this button to Add the your Custom Side Module Link. If you only click on the Update button on the bottom of the screen, your new Custom Side Module Link will not be added. The Update button only updates existing content.